Pájaros are birds bred to be the fastest runners of all on the race course. In Pájaro Racing, you can choose from five different colored pájaros, each with different statistics! Plop one of fourteen hats on top of your pájaro to accessorize it and boost its abilities. Race your pájaros on the track and try your hardest to be the victor! You can keep up to four different pájaros and manage them in the hatchery and stables. 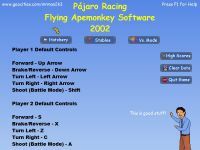 Pájaro Racing includes five race courses and three mini-game modes. The quirky mini-games have themes ranging from avoiding a screen full of crabs on the beach, to blowing up more snowmen than your opponent! Challenge Afroman, corporate logo Mr. Peanut, history teacher Mr. Bartos, Argentinian popstar Justo Lamas, and a secret opponent! Can your pájaro beat the best of the best?